G'mornin Friends! How was your week? I hope you've had a little time to enjoy moments with loved ones, and of course, time doing what you love. In our home, we love the bustling energy of the local farmers market, and after a busy week, it's just the kind of thing we love to do to unwind. Strolling the stands with a delicious coffee in tow (such as from Collective Coffee) dreaming up just how we'll use the fresh ingredients and treasures we find. This kind of a day is SUCH a fave of ours. We only visited the market a few times during the Summer, but it's just fine by us. Autumn is when things slow down a little bit, crowds are smaller and the stands fill up with beautiful and seasonal root vegetables, squashes, and wonderful preserves. But it screams market stands and seasonal fruits and veggies to me! 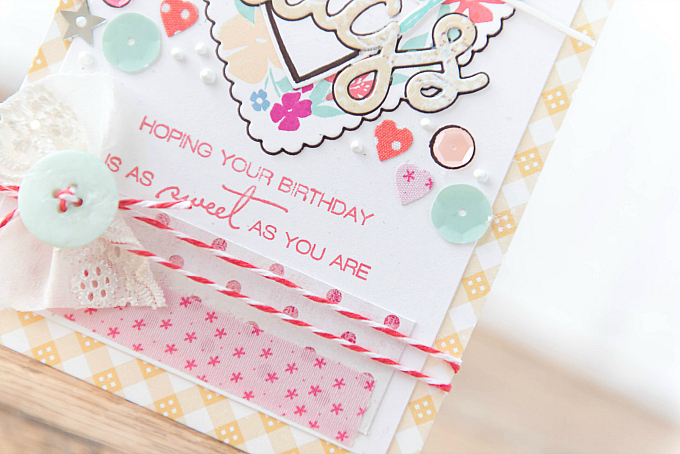 I started this card with a gingham patterned paper, followed by a piece of Rustic White cardstock from PTI. To crate the heart, I used Papertrey's Limitless Layers: Hearts and stamped a pretty heart wreath from WPlus9's Fresh Cut Wreaths. 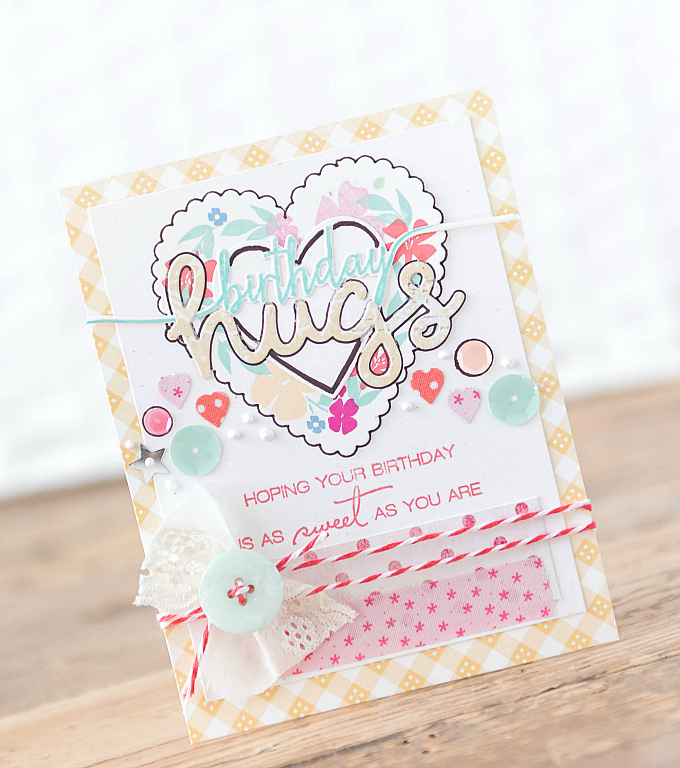 The birthday sentiment is from PTI's Swoosh stamp set and die, and the hugs sentiment is from Lawn Fawn's Scripty Hugs die. Inks used here are from Papertrey Ink in colors of Raspberry Fizz, Aqua Mist, Hawaiian Shores, Harvest Gold, Lovely Lady, Vintage Jadeite, and Blueberry Skies. 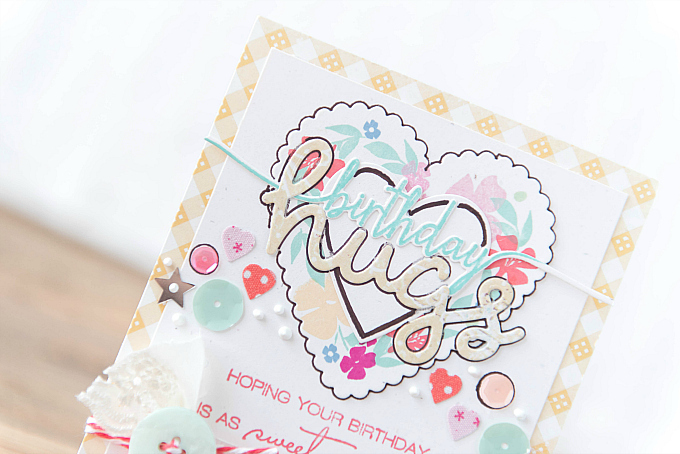 To really add some life to the card, I used a collection of sequins, and fabric die cut hearts, as well as some liquid pearls around the main heart. The rest of the sentiment is stamped in Berry Sorbet ink and is from the Just Desserts stamp set. 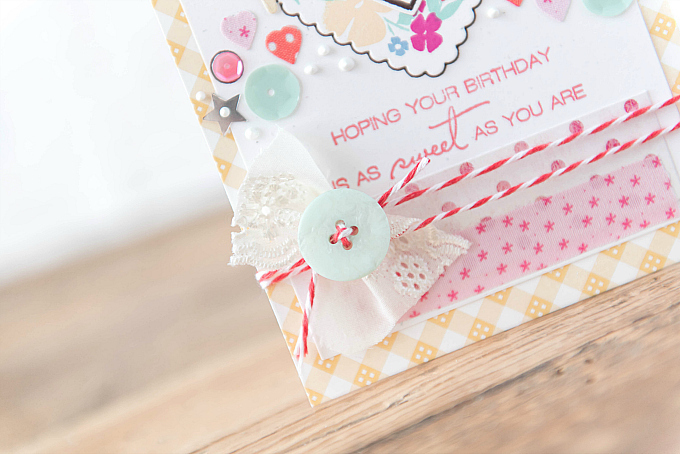 At the bottom of the card, I added some washi tape, dotted paper, a button, twine and some lace for a delicate bow. I can't wait to dig through my cupboards, and get started on my market list, so that's all from me today! Happy weekend, friends! Pretty! 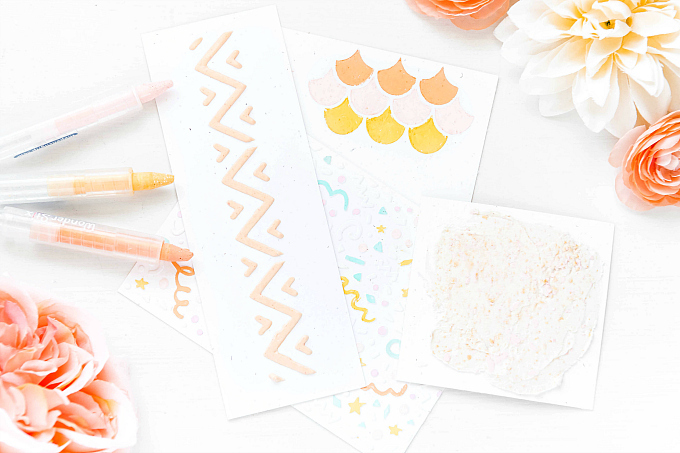 The black doodling borders are genius! I don't think I would have the nerve to try that, but you did. Well done, you! Aw, Charmaine! You are too sweet! Really! I felt the same way but just decided to go for it anyway :) Not perfect, but I'm totally ok with that :) Sending you hugs!